It’s not because I’ve been out spreading California merriment across East Flanders. God, I wish that was the case. That would be more fun. No, I stress over the details of the race later today, my fifth and final event of the 10-day Kerstperiode block of Christmas cyclocross racing in Belgium. I’m not stressed about the racing itself. Despite the weekly whoopings, I still love it. It’s the logistics. In five hours, I’m set to drive myself, my two CX-racing neighbors and all our gear to the race, yet my organization and preparations have deteriorated over the past week and a half. I’d started flailing to keep everything together, which is no way to prep for a bike race. By quarter to five, the brooding rumbles to a roar inside my head. What began as packing ponderings has turned to full blown existential crisis. Is this silly Belgian cyclocross dream ruining my long-term health, my career prospects and the general well being of my future self? What am I doing with my life? I’m almost 30, and I’m splashing around in the mud in Northern Europe. I put on a pot of coffee, and sit starring out the dark window–it’s deep winter in Belgium and the sun won’t come up for another four hours. Few things are as cruel as the wee hours of the morning, for a solitary, restless mind. By half past ten, I’m in Baal anyway. Instead of racing, I’ve come to help Nick Smith and Declan Prosser, two U23 Australian racers spending the later half of the season cutting their teeth on the Belgian cyclocross scene. We all stay together at the same cycling bed and breakfast, and we’d spent Kerstperiode traveling to the World Cups and Super Prestige races together. Since removing the racing from my day, things started to feel better. I look forward to helping the two youngsters throughout the day. Besides, I’d spent the first part of the New Year brooding around the house, no need to sit there and feel sorry for myself all day. For the first time in my bike-racing career, I get out of the car and am not thinking about what I need. Well, I think about what helps me as a racer, and translate that to: What do the boys need? They need trainers set up. They need their bikes cleaned after the recon. They need their shifting dialed in. They need their tires at just the right squish. They need to be ready to roll to the start 20 minutes before the gun. Declan’s father, Miles, and I need to be in the material post ready to catch the first muddy bikes when Declan and Nick come flying in. They need to not think about any of this. They just need to relax and race. I climb into the trailer and fire up the generator. The tools come out. The soap bucket bubbles. Chains are oiled. Tubulars are precisely pumped. It’s hectic but organized. The goal today doesn’t involve personal results for me. It’s all about the boys and the bikes. I don’t mind the time crunch of the pressure to juggle all the tasks–I’m at a cross race in Belgium. There’s a clear goal. There’s no place I’d rather be. That weight that sat on my chest six hours earlier lifts as the power washer mists into my face and the generator fumes waft up my nose. The U23 gun goes off at noon. Miles and I stand in the pit waiting for the bike exchanges–there will be many today. It’s been raining for the past several days and the already hilly course is a heavy mess of thick mud and soupy puddles. Standing on the other side of a bike exchange is new territory for me. I’m normally the breathless racer hopping onto a clean ride. Not today. I pop my pit cherry. As Nick and Declan come in, it’s a race to the power washers along with the other 50 mechanics in the pit. We’ve got about four minutes before they come through the second pass, and who knows whether they need a new bike every half lap? Only the racer knows. And with a good pit crew, they know it will be there every time they’re ready for an exchange. 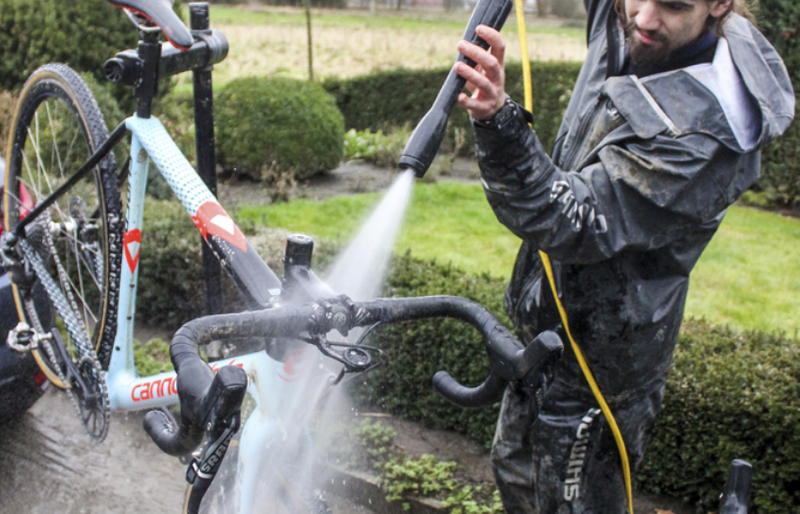 “What would make me really happy as a racer?” I think as the eight power washers splatter mud and grit all over fishing waders. Nick and Declan put in great rides. In Declan’s third Belgian cyclocross he finishes 36th. It’s Nick’s fourth time to Belgium, and he manages 27th place, despite yours truly bungling one of the handoffs. The-20-year old Aussie is too nice to get upset, even though the bike racer in me knows I screwed up, along with every other mechanic standing in the pit. Despite that hiccup, the day is one of the highlights of the season. I realize this as I pack up the car, and my partner Annick walks up and says, “You look like you’re glowing.” I want to argue that it’s just the chain lube and dish soap that I’d been rubbing on my face for the last four hours, but I really feel it too. Sure, I wish I had raced. God, how badly I wanted to go drifting through those ruts as I watched the U23s bump and slide through the soupy swoops. Still the feeling of being at a bike race, in the middle of the action, working towards a goal–even if it’s not my usual selfish one–invigorates me. It isn’t torture being so close, yet so far from the racing. It’s rejuvenating. It’s revitalizing. It’s restored my faith in the decision to come to Belgium to race bikes. After all, it’s not just about the time between the tape–it’s about immersing myself in the heartland of this whacky sport and culture. I yawn as we motor around the Brussels Ring on our way back to Oudenaarde. Today is not the day I had planned, but I don’t think I could have imagined such a great start the New Year. I know I’ll have no trouble sleeping tonight.